During my competitive cross-country running days it wasn’t uncommon for me to run five miles at five o’clock in the morning and another nine miles at nine o’clock at night, five days a week. I was competitive. I wanted to win races. And I was smart enough to know that if I dedicated myself to extra training, while my opponents were lounging or socializing, I would often be one step ahead of them when we crossed the finish line. When I first started these early-morning and late-night runs, the experience was pretty overwhelming. My body didn’t want to cooperate—it ached and cramped up. My mind resisted—it came up with a laundry list of excuses. And I found that the only way to consistently endure the extra training was to disassociate my mind from my body, putting my mind somewhere else while my body ran. Over time, I became quite proficient at doing this. I got so good at it, in fact, that I actually looked forward to running. Because when I ran, my mind was clear, my body was in rhythm, and I was at peace with the world… especially when nobody else was around. In the midst of what appeared to be a strenuous workout, both my mind and body were in soothingly tranquil states of being… similar to that of a deep meditation. I don’t compete in races anymore, but I still run a few miles almost every day. And even though I have a flexible work schedule now, I typically still run in the wee hours of the morning or fairly late at night. Since my friends and family know I have a flexible schedule, most of them say I’m “weird” for running at such odd hours. I’ve tried to explain to them why I do it, and how it soothes my mind and body. But they can’t relate. So, I’m still just a “weirdo” in their eyes. Last night, after a long flight into San Diego to finalize some preparations for next month’s Think Better Live Better conference, I went running on the Pacific Beach boardwalk at 11:30 P.M. It was calm and quiet out—just the way I like it. I was about three miles into my run when a peculiar looking woman sitting on the boardwalk’s barrier wall shouted, “Hey, you!” and then waved me down. My first inclination was to just ignore her and continue running. But my curiosity got the best of me. So I stopped. The woman was middle-aged with tan skin, long dirty blonde dreadlocks, several piercings in her ears and nose, tattoos on both arms, and a tie dye Grateful Dead t-shirt on. She was strumming an acoustic guitar and had a thick, white joint burning in a small ashtray beside her. “It’s none of my business,” I quickly replied. “Anyway,” she continued. “Perhaps you don’t realize this, but it’s pretty late to be out exercising. And I know I’ve seen you out here a few times before, running after midnight.” She was right. Angel and I visit San Diego several times a year, and I often run the boardwalk late at night. “So, what’s your point?” I asked. I told her about my love for a quiet landscape, and the way in which running soothes my mind and body. “…like a deep mediation,” I told her. I stared at her for a moment and then laughed, because I knew she was right, again. “Yeah, I can dig that,” I said. She winked and started strumming her guitar again. I winked back and started running again. Some of us run in the middle of the night. Some of us strum acoustic guitars and smoke joints. And others do hot yoga. Or sip expensive wine. Or surf on dangerous waves. Or jump out of perfectly good airplanes. When we try to understand people by personally relating to the things they do, we usually can’t make any immediate sense of it. Because it’s easier to see weirdness in a sea of normality, than it is to decode the logical methods behind one’s madness. Truth be told, every passing face on the street represents a story every bit as captivating, complicated and weird as yours. When you look at a person, any person, remember that everyone has a story. Everyone has gone through something that has inadvertently changed them and forced them to adapt and grow. Everyone you meet has struggled, and continues to struggle in some way, and to them, it’s just as significant and worthwhile as what you’re going through. We are all different. We are all amazingly weird in our own way. And when we take time to listen to each other, instead of judging each other, we learn and grow stronger, together. One of the most incredible changes Angel and I have made in our lives, which has undoubtedly made us happier people and better friends to everyone we meet, is learning to let go of our tendency to judge others. Now, I’m not going to sit here and pretend that we don’t ever make snap judgments about people; we all have a tendency to do so by default—it’s an innate human instinct. I almost judged that woman on the boardwalk before I even spoke with her. So, Angel and I are not the exception here. But we have learned to catch ourselves. What unnecessary or idealistic expectations do you have of this person? What’s something you can appreciate about this person right now? But in any case, remind yourself that you can’t help them at all from a position of judgment. And you can’t help yourself either—because judging people all the time is stressful. Since Angel and I intellectually understand why we shouldn’t judge people, but sometimes still forget when we’re in the heat of the moment, we’ve implemented a simple strategy that continuously reminds us NOT to judge (and to ask ourselves the questions listed above instead). Anytime we’re heading into a social setting where we feel the itch of judgment stirring inside us, we read the quotes listed below (compiled from our book and blog archive) to ourselves before we leave the house or office. Doing this on a regular basis over the years has gradually changed how we see and treat people from the get-go each day. We still have to practice, of course, but our default tendency to judge others is diminishing more and more with each passing year. Everybody you meet is afraid of something, loves something, and has lost something. Know this. You never know what someone has been through, or what they’re going through today. Don’t be lazy and make empty judgments about them. Be kind. Ask about their stories. Listen. Be humble. Be teachable. Be a good neighbor. Some people build lots of walls in their lives and not enough bridges. Don’t be one of them. Open yourself up. Take small chances on people. Let them shift your perspective. We all take different roads seeking fulfillment, joy, and peace. Just because someone is traveling a different road, doesn’t mean they’re lost or going the wrong way. No one has ever made themselves strong by showing how small someone else is. Remember this, and communicate accordingly. The single greatest problem in communication is the illusion that it has taken place. Too often we don’t listen to understand—we listen to reply. Bring awareness to this. And listen for what’s truly behind the words. Be present. Be thoughtful. Compliment people. Magnify their strengths, not their weaknesses. This is how to make a real and lasting difference in your relationships, new and old. Set an example. Treat everyone with respect, even those who are rude to you—not because they are nice, but because YOU are. And do your best to be thankful for the rude and difficult people too; they serve as great reminders of how not to be. People will rarely think and act exactly the way you want them to. Hope for the best, but expect less. Agree to disagree when necessary. And be careful not to dehumanize those you disagree with. In our self-righteousness, we can easily become the very things we dislike in others. People are much nicer when they’re happier, which says a lot about those who aren’t very nice to us. Sad, but true. The way we treat people we disagree with is a report card on what we’ve learned about love, compassion and kindness. Let’s just wish them well, and be on our way. The wisest, most loving, and well-rounded people you have ever met are likely those who have been shattered by some kind of heartbreak. Yes, life often creates the best humans by breaking them first. Their destruction into pieces allows them to be fine-tuned and reconstructed into a masterpiece. Let this continue to remind you to be way kinder than necessary, every step of the way. Some of the quotes above (like numbers 6 through 9 for example) potentially require a willingness to cordially deal with people who yell at us, interrupt us, cut us off in traffic, talk about terribly distasteful things, and so forth. These people violate the way we think people should behave. And sometimes their behavior deeply offends us. But if we let these people get to us, again and again, we will be upset and offended far too often. Be bigger, think bigger. – Imagine a two-year-old who doesn’t get what she wants at the moment. She throws a temper tantrum! This small, momentary problem is enormous in her little mind because she lacks perspective on the situation. But as adults, we know better. We realize that there are dozens of other things this 2-year-old could do to be happier. Sure, that’s easy for us to say—we have a bigger perspective, right? But when someone offends us, we suddenly have a little perspective again—this small, momentary offense seems enormous, and it makes us want to scream. We throw the equivalent of a two-year-old’s temper tantrum. However, if we think bigger, we can see that this small thing matters very little in the grand scheme of things. It’s not worth our energy. So always remind yourself to be bigger, think bigger, and broaden your perspective. Mentally hug them and wish them better days. – This little trick can positively change the way we see people who offend us. Let’s say someone has just said something unpleasant to us. How dare they! Who do they think they are? They have no consideration for our feelings! But of course, with a heated reaction like this, we’re not having any consideration for their feelings either—they may be suffering inside in unimaginable ways. By remembering this, we can try to show them empathy, and realize that their behavior is likely driven by some kind of inner pain. They are being unpleasant as a coping mechanism for their pain. And so, mentally, we can give them a hug. We can have compassion for this broken person, because we all have been broken and in pain at some point too. We’re the same in many ways. Sometimes we need a hug, some extra compassion, and a little unexpected love. Try one of these strategies the next time someone offends you. And then smile in serenity, armed with the comforting knowledge that there’s no reason to let someone else’s behavior turn you into someone you aren’t. To instill more love into this world. To love what you do, until you can do what you love. To love where you are, until you can be where you love. And, above all, to love the people you are with, until you can be with the people you love most. Fewer judgments. Less resistance. More love. Ultimately, this is the way we find happiness, opportunity, and peace in life. Please share this post with others who you think may benefit from it, and also share your thoughts with us in the comments area below. If you’re up to it, I’d love it if you shared an additional quote or personal saying that reminds you to treat others kindly and with less judgement (for both their sake and yours). The word “weird” has been following me for my entire life. At a younger age I felt offended but now in my mid-forties I fully embrace it. Weird, odd ball, hippie, etc… all of these names often have negative connotations by the ones doing the name calling, but I’m perfectly fine being myself. It’s great to see that you get so much from running. The IDEA of running is always more exciting than actually running in my case. For me cycling and yoga help me recenter and focus on the now. Anyway, I wholeheartedly believe that if we consciously look within ourselves we can see a little bit of us in everyone else and vice versa. Too often we judge prematurely and fail to make relationships work because they think someone is “weird”. Your article here was lovely and I believe we can all learn from it. 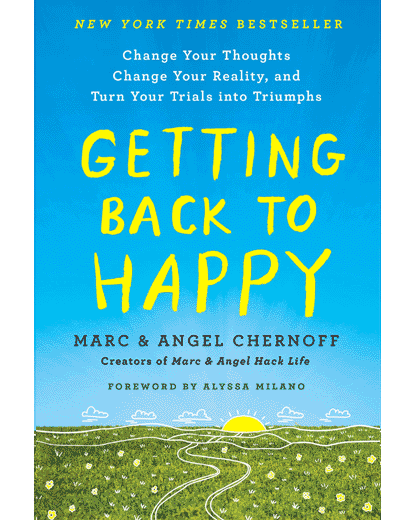 Thank you, Marc & Angel, and I’ll be seeing you next month at Think Better Live Better 2018! P.S. My addition to the list of quotes also comes from your book: “The most memorable people in your life will be the ones who loved you when you weren’t very loveable.” It’s something I always try to keep in mind. Marc, I absolutely love the opening story and the anti-judgmental relationship quotes you’ve shared here. Cheers to being a little on the weird side! And cheers to running at night too—I often take runs in the later evening hours too. McKay, it’s great to hear that you’re finding value in the bi-weekly emails we send. Excellent addition to the list! And thanks for the positive feedback. Your work is always an inspiration to me, M&A. Although this is the first comment I’m leaving publicly on your blog, we have had many conversations through your Getting Back to Happy course over the past year, whihc I apprecaite. Today though, I finally wanted to contribute something here as well. Lori, it’s truly been an honor to work with you in the Getting Back to Happy course and witness your progress firsthand. YOU are an inspiration! And thank you for sharing that quote Angel wrote. If that ain’t the truth! A quote that comes to mind when it comes to dropping my self righteous momentary anger and letting things go? “Swallow your pride, it’s not fattening”. Haha! That’s a good one, Grace. Thank you. Marc, I love the blog post. We really do need more positivity in how we treat other people, most people are far too quick to judge others based on their own limitations. At the base level, you are so right, we are all human and everyone has their struggles, loves, fear – we all have depth. Always try to avoid quick judgements of others. How does your advice apply to coping with President Trump? Rick, no matter who the subject is who is upsetting you, the key to remember is that while you may not be able control all the things they say and do, you can decide not to be reduced by them. And this requires calmness of the mind. Truly, the ultimate measure of your wisdom and strength is how calm you are when facing any given situation. Calmness is indeed a superpower. The ability to not overreact or take things personally keeps your mind clear and your heart at peace, which instantly gives you the upper hand. From this mindset, you are better able to take clear, focused actions that make a difference. What makes you think that President Trump would not find you difficult to cope with? What makes you more right than him. Many do not find him difficult to deal with. What makes the difference? This script hit home so well! I loved reading all of it and you both have so much insight into people and into living. Thank you so much for sharing . I recently have undergone two times open heart surgery in India, Chennai . I have almost ceased hope to get back into this world but the prayer of my students, parents, well wishers and friends reached to God and so I am back. But after that I was under stress. Your Marc and angel literature on life strongly motivated and reignited the flame of my life. Now I am living a more normal life—my normal. Thank you Marc and thank Angel for all that you done for the people like me. I am teacher by profession. Stay strong, friend. Angel and I are thinking of you. How do I deal with a husband who constantly interrupts me, corrects me, tells me I’m wrong? I truly agree with your article when I’m interacting with others, but here at home I feel the need to learn how to stand up for myself and be respected too. Karen, it’s important to understand that it’s not one or the other—you can be kind to your husband and also stand your ground. Don’t fall into the trap of fighting misbehavior with more misbehavior. In your case, I’d start with taking positive control of negative conversations between you and your husband. It’s okay to change the topic, talk about something positive, or steer conversations away from pity parties, drama, and self-absorbed sagas. Be willing to disagree with him and deal with the consequences. Some people really don’t recognize their own difficult tendencies or their inconsiderate behavior. You can actually tell him, “I feel like you ignore me until you need something.” You can also be honest if his overly negative attitude is what’s driving you away: “I’m trying to focus on positive things. What’s something good we can talk about?” It may work and it may not, but your honesty will help ensure that any communication that continues forward is built on mutually beneficial ground. This, of course, is just the first step. Communication truly is the key because he might be thinking that she is being difficult while she might be thinking the same thing of him! He might think she ignores him, while she might think he is avoiding certain activities with her! He might think that she only goes to him when she wants something, but she might feel that it’s the only way to get his attention. He might think she is ungrateful but she might feel that he doesn’t truly understand her. She might also want to let him know that the communication wasn’t always clear but it still is always important! It may not always be 100% positive either because if it were, this means that they are avoiding the real issues and only telling the other person what they want to hear, so the communication is probably useless. I’m not saying to be hurtful or inconsiderate, but to be open and upfront about the issues. “…there’s no reason to let someone else’s behavior turn you into someone you are not.” Best words ever! To thine ownself be true. Thank you for the mental tips to keep myself in check and balanced when dealing with challenging people. It is especially helpful to have empathy toward someone because truly we do not know what they are dealing with or where they have been. A level of detachment is a beautiful thing. Some call it professional distance. People accuse me of “not caring,” which is the furtherest from the truth. I care, I just choose how I react, respond, etc. I don’t indulge in hyper-emotionality and sensitivity and outrage that seems to be so in fashion right now. Hey Marc – it warms my heart to know that like my husband and myself, there are so many others out there who see the necessity for greater civility and respect. Great piece…it made my day! Recently I a very bold step in co-founding and releasing WalkTheRidge.ORG – a movement to practice and promote respect and civility between people who have different opinions and views. Instead of using our voices against the opposition, we promote using our voices to ENGAGE the opposition. We believe that there is good on BOTH sides and if we open ourselves up to ‘seeing’ them for more than the box they check on election day, ‘hearing’ their story to understand how and why their views are shaped, and do so in a ‘respectful’ way that people will rise up from their valleys of like-minded people and Walk The Ridge in a spirit of understanding, openness, and kindness. So I’ll put in my 2 cents with the WTR motto: I SEE You…I HEAR You…I RESPECT You. Marc, your blog post speaks volumes to me, as does Shella’s response. I’ve known for a while I need to work harder on my responses to people I find challenging. Thank you both for the compelling reminders that I need to continue working on this. Thanks for your inspirational words of wisdom. I loved it so much I shared it on my facebook. I love this article very much since it has taught me many things that I didn’t expect. Most people see when you do a unique thing is like you don’t think but this article has shown to us wherever you come up with an article don’t leave it out since others are envious of you. Before judging someone. Take a good look at yourself. Dear Marc and Angel thank you for appearing in my life! All your posts are so relevant and always speak to me in a way that no others have.. have just bought your book and in a few month’s time with a bit more £ will sign up for the course. Thank you so much. Thanks for good message. God bless you Marc and Angel. I am a RN and find myself taking care of difficult humans often. They are in the hospital for one reason or another and most do not have great coping skills. I often think of myself as a kind and compassionate individual, but lately have had a very tough time with rude and difficult patients-I’m finding myself more short tempered and intolerant of their behavior-a bit self-righteous I’m afraid. Thank you for this article as it has refreshed my perspective and I look forward to reading and re-reading the quotes when I find myself faced with a patient’s behavior that makes my blood boil. I do not wish to allow people to mistreat or disrespect me, in general not just at work, but also do not want to mistreat and disrespect others in return or in reaction to their behavior.